“If this isn’t intimidation, I don’t know what is – it’s a very clear message to anyone: How dare you protest against us and, if you do, we’ll find you fit for work!” Anti-Atos protester Joanne Jemmett with the sign left by Atos workers outside the assessment centre in Weston-Super-Mare on Wednesday (“Fit enough to protest – fit enough to work!”) at the start of this short film documenting the demonstration there. Watching the stories stack up in the wake of the national day of protest against Atos last Wednesday has been very interesting. The immediate response was that Atos has approached the government, seeking an early end to its contract. This deal, under which Atos administers the hated Work Capability Assessments to people on incapacity or disability benefits, would have been worth more than £1 billion to the company over a 10-year period. Allegedly, company employees have been receiving death threats, both during and after the protests. We’ll come back to those shortly. The Conservative-led Coalition took this development in the way we have come to expect – spitefully. A DWP spokesperson said that the company’s service had declined to an unacceptable level, and that the government was already seeking tenders from other firms for the contract. This is what happens when bullies squabble. Atos is the big bully that has just had a shock because the other kids in the playground stood up to it and made it clear they weren’t going to stand for its nonsense any more. We’re told that all bullies are cowards and it appears to be true in this case – Atos went running to the bigger bully (the government) and said it was scared. The government then did what bigger bullies do; it said Atos was rubbish anyway and set about finding someone else to do its dirty work. I should clarify that companies don’t actually pay for contracts; they offer to carry out the work at the lowest prices they think are viable, in competition with other firms. The government chooses the company it feels is best-suited to the work. In this situation, it seems likely that the possibility of death threats may put some firms off even applying. So let’s come back to those threats. A spokesperson for the organisers of Wednesday’s demonstration tells us that pickets took place outside 93 Atos centres, across the UK. Most of these were very small – averaging 30 people or less (I can confirm that in Newtown, Powys, a maximum of 15 people attended at any one time). Brighton and London were bigger, but 12 demos had only one person present. “That is really funny because, as you have seen, Atos are saying they had to close down all their centres for the day – up and down the country – because of huge hoards of scary, threatening disabled people issuing death threats,” the spokesperson said. Disabled People Against Cuts (DPAC) and sister group Black Triangle issued a joint statement: “The bizarre exit strategy Atos have developed in identifying apparent physical threats on Facebook despite the growing lists of real deaths caused by the WCA regime is an outrageous insult to all those who have died and all those who have lost family members through this regime. “It is an insult to those left without their homes, without money and needing to go to food banks. I would strongly urge all readers to put their support behind the remainder of the statement, which asserted: “The Work Capability Assessment must also end. “The reign of terror by this unelected Coalition Government which has awarded itself pay rises and cut taxes for those earning more than £150,000 while piling punishment, poverty, misery and premature death on everyone else in its policies of rich against poor must end. “Make no mistake – we will continue to demonstrate against ATOS, now delivering the complete failure of PIP in which claims are being delayed by up to a year. “We will demonstrate against any other company that takes over the WCA contract. In my article on the Bedroom Tax evictions taking place in my home town (yesterday) I made it clear that too few people are bothering to pay attention to the evils of the Conservative-Liberal Democrat Coalition government. That article received a huge response, garnering almost four times the readership of other recent posts within just 24 hours. The situation described in this article is much worse – people aren’t being evicted from their homes; they are being forced off of the benefits that have kept them alive, pushed – by the government! – towards destitution, despair and death through either suicide or a failure of their health that their Atos assessment results deny should ever take place. Today’s article should have more readers, after the success of yesterday’s – but we’ll have to see, shan’t we? If fewer people read it, we’ll know that they all just looked up for a moment, thought, “Oh, that’s interesting,” and went back to whatever distraction keeps them happy in the face of impending government-sponsored pain. Any attempt to inform the public will fail if the public stops paying attention. Let’s keep it focused where it belongs. Vox Political is an independent political blog. We don’t receive any funding other than contributions from readers. Vox Political cannot continue without YOUR help. The Coalition government has finally put its cards on the table, calling for the completion of a ‘free trade’ agreement with the United States of America that will end democracy as we know it today. Do you think this statement is needlessly hyperbolic? In fact, it probably does not make the point strongly enough! You will lose the ability to affect government policy – particularly on the National Health Service; after the Health and Social Care Act, the trade agreement would put every decision relating to its work on a commercial footing. The rights of transnational corporations would become the priority, health would become primarily a trade issue and your personal well-being would be of no consequence whatsoever. Also threatened would be any other public service that has been privatised by this and previous governments, along with any that are privatised in the future; all would fall under the proposed agreement. So the debate over energy bills would be lost because gas and electricity provision would come under the agreement, along with water and the Royal Mail, among others. Speaking today (Wednesday), Osborne announced: “We should set ourselves the urgent task of completing the transatlantic trade and investment partnership – the EU-US Free Trade agreement. “This would be the world’s biggest ever trade deal – together our economies would account for half of global output. “The Commission estimate it would boost the European economy by 120 billion euros a year – that’s over 500 euros for every family in the EU. It would bring £10 billion pounds a year to the UK alone. “Some in the European Parliament talk about stalling this Trans-Atlantic Partnership to pursue other agendas. “But when a quarter of young people looking for work in Europe are unemployed, this would be a complete betrayal. Did you notice that, for him, it’s all about the money? Yes – he mentions job creation. But these jobs would be provided under terms dictated by the hugely powerful global corporations. Their bosses would take the profits and ground-level employees would be treated like – well, like Orwell’s metaphor for the future: a giant boot, stamping on your face, forever. You may have heard very little about this – and for a good reason. The architects of the planned agreement want the deal done before anybody realises what is going on and organises robust protest against it. The US/EU Trade and Investment partnership (TTIP), called Transatlantic Free Trade Agreement (TAFTA) in the US, is a bilateral trade agreement between the US and the EU. It goes much further than any previous EU trade agreement in deregulating, in establishing the rights of transnational corporations and in undermining the ability of governments to control corporations. It is set to completely change our society, and is already in process, as with the NHS. ‘Trade’ and ‘international trade agreements’ are different. While most people would consider trade to be good thing, international trade agreements give rights to transnational corporations while reducing states’ rights to regulate them, thus reducing democracy. All free trade agreements include goods, services and intellectual property rights – but the additional elements of the TTIP that are the main part of the agreement are much more far-reaching. These are regulatory harmonisation, investor state dispute settlement and the intention to establish global rules via these trade agreements. ‘Regulatory harmonisation’ means ‘harmonising’ regulation between the EU and US, downwards to the most lax form, across all areas, to suit transnational corporations. This will mean the degrading of regulation on health and safety, food, environment, labour standards, privacy and much more, including financial services regulation. The NHS is now already ‘harmonised’ with the US corporate-access public health model – and this was always the Conservative Party’s plan. TTIP will also include ‘Investor State Dispute Settlement’ (ISDS), allowing transnational corporations to sue governments directly for the loss of any future profits resulting from any government action, at any level, such as new legislation. Where ISDS is already included in ‘trade’ deals, it is shown to lead either to big payouts from governments to transnational corporations or to deter governments from legislating – the ‘chill’ effect. In theory, this means that if a national government had banned a product – a toy, perhaps – on the grounds that it was harmful to health because it contained lead – for example – the manufacturer could then sue that government for infringement of the TTIP. The national government would lose, and our children would come down with lead poisoning. In practice, we can see a classic example in the current lawsuit taken out by Philip Morris, the antipodean tobacco giant, against the Australian government over the law that enforces plain packaging on all tobacco products there. The law was enacted to discourage people from smoking – an act with proven health risks – but it seems likely that Philip Morris will win because Australia’s government has restricted its ability to make massive profits. TTIP and the TPP are intended to set global ‘trade’ rules which will eventually become the norms for the multilateral World Trade Organisation, but formulated outside of a structure that allows other countries to jointly resist the corporate-dominated agenda. As with all bilateral ‘trade’ agreements, TTIP negotiations and agreement texts are secret until the negotiations are completed – ensuring that the public cannot protest against them until it is too late. Trade agreements are effectively permanent. Although international ‘trade’ agreements are negotiated government-to-government (by the Trade Commission for EU member states), they are promoted and driven by transnational corporations, which benefit from states being bound by international trade law – these are the the same transnational financial service corporations that caused the global financial crisis. As part of the TTIP, a framework for the ongoing ‘harmonisation’ of all future regulation is being put in place with the setting up of a Regulatory Co-operation Council. This non-elected Council will be able to override national and EU legislation. ‘Public procurement’ – government spending – is a major target in the international trade agenda. 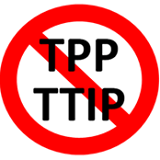 The TTIP is being rushed through, with the aim of completion by the end of this year (2014). TTIP will include provision for the movement of temporary workers across borders. This will inevitably mean cheap labour, and the undermining of working conditions and labour rights, especially in a context of degraded regulation. These are the jobs George Osborne wants for you! The Trade Commission has set up a communications ‘spin’ unit to manage public opinion on the TTIP. Once TTIP negotiations are completed, the European Parliament will only have the right to say yes or no, to the deal, with no amendment allowed. It will then, as with all EU ‘trade’ agreements, be provisionally implemented before it comes to member state parliaments for ratification. In the US, the government is seeking ‘Fast Track’ provision or Trade Promotion Authority (TPA) from the Congress. If granted, US representatives will similarly only be allowed to pass the agreement or not, without amendment. But more must be done. You – that’s right, YOU – need to contact your MP and your MEP and make sure they oppose this evil plan to stamp on your rights. Then you – that’s right, STILL YOU – need to get involved in setting up and building local and national groups to fight it, while you still can. DON’T expect someone else to do it for you or you’ll end up a corporate slave. … which is exactly what George Osborne wants. – This is a song by a local musician, here in Mid Wales, written during the last serious flooding. I make no apologies for opportunistically linking to it as it says a few choice words about the situation and the government. “And the rains came down, and the floods came up” – The Wise Man and the Foolish Man (Southern Folk Song). Some of you may have noticed we’ve had a few spots of wet weather recently. This is nothing new to our island nation. The trouble is, having fallen on us all, the water hasn’t had the decency to clear off and drain away. Instead, it has built up and up and caused a huge amount of flood damage to land and houses that were not built in a safe place, as in the song lyric quoted above, but in flood plains. This is a result of bad planning – by water and sewerage companies that have failed to implement successful drainage schemes or to divert floodwater from rivers in order to prevent overflow, and by planning authorities that have allowed housing to be built in the wrong place. My guess is that the water companies were thinking about the money, and planning authorities wanted to ease overcrowding. We live in a country where management of the water supply went into private hands several decades ago. When that happened, it became impossible to have any kind of integrated plan to deal with the supply of water, droughts, floods and storage. Water supply became a commodity to be bought and sold by rich people according to the golden rules of capitalism: Invest the minimum; charge the maximum. So reservoirs have been sold off to foreign water companies, meaning we have no adequate response to droughts. None have been built, meaning we have no adequate response to floods. Concerns about river flooding have been neglected. There has not been the investment in extraction and storage of floodwater that repeated incidents over the last few years have demanded. The government is reducing its budget for handling these issues. Not only that, but it is delaying implementation of a new policy on drainage. This would be regulated by local authorities, who have responsibility for planning approvals. Some might say these authorities should have had a little more forethought before granting applications to build on flood plains, or for adaptations to existing properties that have prevented water from draining into the soil and sent it down drains instead, to overload the sewer system. Some of these are matters of necessity: Planning officers may have gone to the limit of what is allowed, in order to allow housing developments that relieve the burden of overcrowding; in other matters, they may have been unable to apply any legal restrictions on applications. In short, there is no joined-up thinking. There will be no joined-up thinking in the future, either – unless the situation is changed radically. Meanwhile, the cost racked up by the damage is huge – in ruined farmland, in ruined homes and possessions, and blighted lives. And what about the risk of disease that floodwater brings with it? The NHS in England is ill-equipped to deal with any outbreaks, being seriously weakened by the government-sponsored incursions of private, cheap-and-simple health firms. Something has to give beneath the weight of all this floodwater. Change is vital – from commercial competition to co-operation and co-ordination. Privatisation of water has failed. It’s time to bring it back under public control. Support Vox Political before it sinks without trace! A Labour government would make private companies who provide services at the taxpayers’ expense obey public sector transparency rules, it has been revealed. The change means firms and charities that sell services to the state – for example, all the private companies now working in the NHS – would lose their right to commercial confidentiality. The Freedom of Information Act would be extended to cover them and they would have to reveal their commercial secrets if a FoI request required them to do so. If enacted, this is likely to be more effective in creating transparency of lobbying than the Parliamentary Bill of the same name that is currently working its way through Westminster. The policy was revealed in a Sunday Times article which is paywall protected. Labour has yet to release an announcement on its website. The new policy comes after a 10-minute rule motion by Labour’s Grahame Morris began its journey through Parliament earlier this month. Such motions rarely get very far because the government of the day usually opposes them in the later stages and there is often too little time to complete the debate. But these bills stimulate publicity for their cause, and it seems clear that the Labour leadership has taken this particular cause on board. So it should – concerns are high that unfair advantages are being handed to, for example, the private healthcare companies, who are then able to hide the facts behind the veil of commercial confidentiality. Why should they be allowed to do this when they are providing a public service, funded by the citizens of the UK? Existing NHS operators do not have the advantage of commercial confidentiality and must provide details of the way they operate if a FoI request is submitted to them. This makes them vulnerable during the bidding process for NHS contracts, as private operators can ask about the current providers’ operations and then undercut them to get the work. Then there’s the so-called “revolving doors” practice, in which government advisors move to lucrative contracts in the private sector, often after providing advice that changes government policy in favour of their new employer. Mr Morris’s motion noted that “at least five former advisors to the Prime Minister and the Chancellor of the Exchequer are now working for lobbying firms with private healthcare clients”. This is a corrupt practice – the firms gain an unfair advantage because they have, if you like, a spy in government manipulating affairs to their advantage. Nothing is done about this at the moment, nor will the Labour proposal change that situation – but we will all be able to see who the spies are. It would probably be advisable for a future Labour government to put powers in place to reverse any change in the law due to corrupt advice intended to engineer a commercial advantage to a private company. Restricting the movement of government employees to other jobs would be problematic, but if it is known that any changes they effect will be reversed after such a move, then the exercise would become pointless. Companies would not be able to pay a person to influence the government while they remained in the taxpayers’ employ, as this would be a clear case of bribery and corruption. A previous VP article on this subject mentioned the idea of the level playing field – and Labour is to be praised for producing policies intended to restore that principle to government in the face of Conservative and Liberal Democrat efforts to skew the field in favour of their corporate chums. And the corporates themselves? Well, their bosses are likely to be furious and it’s possible that all kinds of threats will come in Labour’s direction. That’s fine. A Labour government can take any such complaint in stride by launching a programme to revise government tax strategy with regard to corporates, and bring any complaining company to the top of the list. Open and transparent: Grahame Morris, who called for a ‘level playing field’ for both private companies and public organisations when bidding for government contracts. Did you know that £1 in every £3 spent by the government goes to an independent or private-sector service provider? If you also recall government ministers bemoaning the fact that £1 in every £4 spent by the government was borrowed, as they said very often during the first year or so of the Coalition, and you bear in mind the fact that all private companies must make a profit, you’ll come to a fairly damning conclusion. 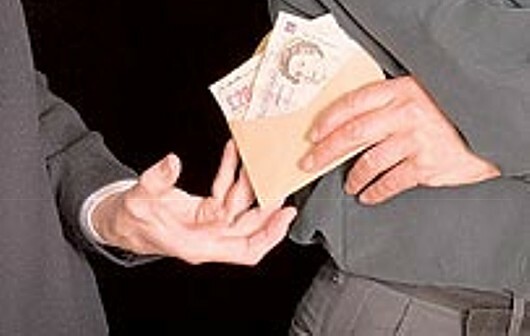 Did you know, also, that private companies – while free to hide behind commercial confidentiality regarding the conditions under which billions of pounds of taxpayers’ money are awarded to them in government contracts – may use Freedom of Information requests to gain detailed information about public sector organisations and then use that knowledge to undercut or outbid those bodies when government contracts are tendered or put up for renewal? FoI regulations give private providers an unfair competitive advantage when bidding for contracts, due to unequal disclosure requirements. Both of these were made clear in Grahame Morris’s short speech in support of his 10-minute rule motion to bring in a Bill amending the Freedom of Information Act 2000 to apply to private healthcare companies, and for connected purposes. 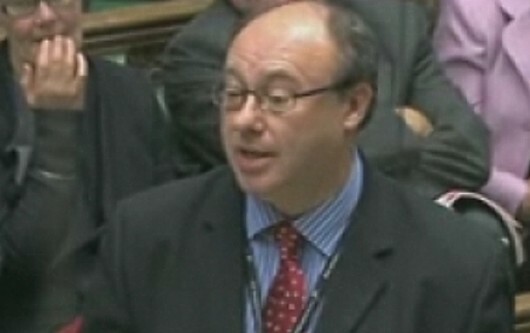 He even pointed out that we are living in a society where freedom of information is routinely censored – stating that he attended a demonstration against NHS privatisation in Manchester at the start of the Conservative Party conference there, “but which was barely reported by our public sector broadcaster”. He said the government should be chastened by recent events. “For example, the tagging scandal — involving Serco and G4S and uncovered by the Serious Fraud Office — showed that these companies had defrauded the taxpayer of more than £50 million. “Perhaps we need a hard-hitting advertising campaign, with advertising hoardings on vans driven around the City of London, warning off corporate fraudsters from bidding for public contracts? He said HCA, the world’s biggest private healthcare company, recently won the contract to provide cancer treatment for NHS brain tumour patients, “stopping patients receiving world-class treatment at London’s University College Hospital”. Mr Morris continued: “The Competition Commission has already caught HCA overcharging private patients in the United Kingdom. In the United States, HCA has had to pay fines and costs in excess of $2 billion for systematically defrauding federal healthcare programmes. Introducing his Freedom of Information (Private Healthcare Companies) Bill, he said its purpose was to strengthen FoI legislation and introduce vital safeguards, so members of the public can see how their money is being spent. It seems he may even have read Vox Political‘s earlier article on his motion, as he said: “I hope that Members on both sides of the House will support fair competition, a level playing field and the duty of equal disclosure throughout the bidding process for NHS services. “The public have a right to know the record of public and private providers before contracts are awarded. Those safeguards can work only if the Information Commissioner has the same rights to seek information and carry out investigations, and to make all providers of public services comply with freedom of information legislation. He said: “Freedom of information is one of the Labour Government’s greatest achievements, ensuring transparency and accountability in modern government and allowing the public access to information on what is being done in their name and how their money is being spent. “In recent years, we have witnessed an acceleration in the number of public services being outsourced, and today roughly £1 in every £3 that the Government spend goes to independent or private sector providers. “Owing to the Government’s policy of opening up public services to the private and voluntary sectors, billions of pounds of NHS contracts are now being made available to the private sector, following the implementation of the Health and Social Care Act 2012. “Unfortunately, while more and more taxpayer money is being handed to the private sector, especially in the NHS, FOI responsibilities are not following the public pound. “There is a big issue here about transparency, because the public should know what is happening in their name, as was brought home to me recently in a demonstration against NHS privatisation in Manchester that I attended, along with more than 50,000 other people, but which was barely reported on by our public sector broadcaster. “Private health care companies should not be permitted to hide behind a cloak of commercial confidentiality. Billions of pounds of taxpayers’ money is being awarded to private sector companies under barely transparent contracts. Although no objection was raised to the Bill going forward, it seems the Coalition has performed an about-face on the issue. Mr Morris said: “I understand that in opposition the Prime Minister was convinced about this matter, having previously promised to increase the range of publicly funded bodies subject to scrutiny using section 5 of the Freedom of Information Act. Sadly, it seems likely that this Bill won’t get very far, for reasons this blog has already mentioned – the Government usually opposes Private Member’s Bills in the later stages and, given their low priority in the schedule, there is often insufficient time for the debate to be completed. But this may not matter, as the information already provided by Mr Morris makes fascinating reading that is damning for the government. A corporate whore servicing one of his clients: Apparently they’re normally called ‘Johns’, but in the high-paid corporate whoring world they’re known as ‘Ruperts’. Both of them. Silly Ruperts. It seems opponents of the Coalition have realised its degraded claim to be a government is worthless and have decided to pour contempt on it at every opportunity. I mention this after seeing Michael Meacher’s excellent column on David Cameron. The fake Prime Minister’s instincts, according to Mr Meacher are “that there is no such thing as the rule of law, and that the only things that ultimately matter are power, fear and money”. These words should come as hammer-blows to Cameron’s credibility. It is to his credit that Michael Meacher has written them – but also to the shame of the Labour front bench that none of them had the guts to come out with it first. Mr Meacher supports his claims by laying out a wealth of evidence that, while the comedy PM crows on and on about Labour’s (non-existent) pandering to the unions, “there is almost nothing… that Cameron won’t do, no commercial interest he will disdain, no policy he will refuse to alter if it will ingratiate himself with the sources of money and power… He has prostrated himself before a wide range of commercial interests by changing government policy to suit them in order to recruit their money and power for himself and his party in the lead-up to 2015”. 1. 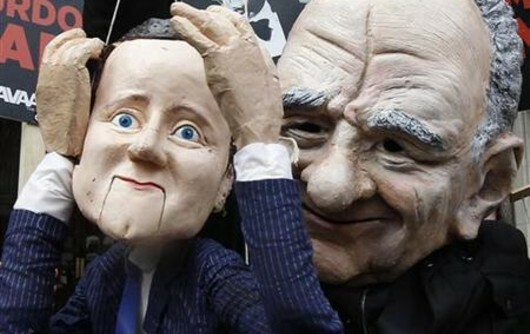 Cameron was determined to hand BSkyB to Rupert Murdoch, in exchange for support for the next general election (he failed in this attempt). 2. He ditched plans to remove branding from cigarette packaging. It has emerged that his advisor Lynton Crosby’s company lobbies on behalf of tobacco giant Philip Morris International. 3. Soon after Crosby was hired by Cameron, the government dropped plans for a minimum alcohol price. Crosby’s Australian company has represented an alcohol industry group campaigning heavily against similar plans in that country. 4. Crosby’s company also represents an oil and gas lobby group that campaigns aggressively for fracking, so now the UK government is encouraging fracking with tax breaks for the companies involved. 5. Crosby’s UK company represented rebel forces in Syria for six months, which may explain Cameron’s decision to send weapons to the rebels (but again failed in the attempt, thanks to a rare outbreak of sanity in the House of Commons). The government will no doubt try to counter these arguments but there is no credible way of doing so. We are able to judge our politicians by what they do – not what they say – and the evidence is available for all to see. So, ladies and gentlemen, let’s change the pitch of news reporting this summer. Instead of the usual ‘silly season’, let’s make it open season on Cameron and his cronies. Let’s get all the evidence against them together and make it clear to the general public, via all possible avenues, what a craven cadre of corrupt corporate prostitutes they all are. It shouldn’t be too hard. Our upstart politicians have an important lesson to learn: Respect. Sometimes events coincide to create a coherent pattern, apparently by accident. So it seemed today, with publicity surrounding the legalised corporate theft of all our images on the Internet, the part-privatisation of the government unit that has been carrying out illegal psychometric experiments on jobseekers… and the publication of my letter to the local newspapers, deploring a previous missive from a Conservative politician who was determined to parrot disproved assertions from his superiors in London, rather than treat us like intelligent creatures and try to connect on an equal footing. We’ll start with the Enterprise and Regulatory Reform Act 2013, which received Royal Assent last week. Under this act, any image that does not contain information identifying the owner (or has had that information stripped away) will become available for exploitation by commercial organisations. These so-called “orphan works” are placed into “extended collective licensing” schemes. Any user wishing to, say, put that silly photograph you uploaded to Facebook onto a T-shirt, only has to perform a “diligent search” for the owner which, when it comes up with a blank, will allow them to proceed with impunity. And they won’t have to pay you a single penny for the use of your work. What can you do about it? Nothing, unless you can afford costly and cumbersome legal action – despite the fact that, previously, ownership of your creation has been automatic, enshrined in the Berne Convention and other international treaties where it is still considered to be a basic human right. That makes it seem like a good thing; in fact, it’s quite the opposite – as you’ll soon find out. Meanwhile, we see that the government’s Behavioural Insights Team – otherwise known as the Cabinet Office’s ‘Nudge Unit’ – is being part-privatised after causing immense embarrassment to the government when it was revealed that a psychometric test it had devised for the Department for Work and Pensions to use on jobseekers was not only fake but, in fact, illegal. The team was established after the 2010 election to – according to the government – find ways of getting people to make better choices themselves, rather than through state intervention. But the psych test foisted on jobseekers by Iain Duncan Smith’s Department for Work and Pensions was the exact opposite of this. Firstly, workless people have been forced to take the test or lose their benefits. Next, the results have been proven to be a sham – it seems you get the same set of personality results, no matter what answers you enter – so there is no possibility of personal choice. Finally, it turns out that the whole exercise is illegal according to both UK and EU law, as “informed consent” is required before anyone takes part in a test of this kind. This is because the test has been presented as research – a “randomised control trial” (see that use of the word ‘control’? Dodgy!) according to a Cabinet Office blog. As fellow blogger Steve Walker stated in his Skwawkbox blog on the subject earlier today (which I have reblogged), “the test itself is not the point – what is being trialled here is the supposed effect of going through it on the subjects of the trials – the unemployed people being made to participate”. Informed consent must be given before people take part in such trials, according to the law. A person cannot be pressganged into it; they must freely make a decision to take part – written, dated and signed – after being informed of its nature, significance, implications and risks. There is also a data protection issue. Apparently a competition is to be held to find a business partner for the Nudge Unit. It might be hard to envisage many reputable firms seeking to collaborate with an organisation that is known to have been acting illegally, but even worse is the possibility that this will be the first of many instances where parts of the publicly-owned, operating for the benefit of everybody in the country, civil service will be hived off into private, profit-making ownership by a government of privateers who can’t wait to get their hands on all that lovely moolah – that should belong to the people, not them. Finally, the letter I wrote last week, in answer to one from the local Conservative Parliamentary candidate, was published today in the local newspaper. It responded, with evidence-based information, to a series of groundless assertions about the bedroom tax, the benefit cap and Employment and Support Allowance, that had clearly been handed down to him from Conservative Central Office. Particularly incendiary was the parroted claim that 900,000 people dropped their claim for ESA rather than take the work capability assessment. This had been disproved and ridiculed on the same day Grant Shapps originally came out with it! It takes a special kind of contempt for your intelligence to repeat, as fact, a claim that we all know is false. The Coalition government seems to be trying to make a living out of it. The attitude that we see, time and time again, is “oh, they’ll take what they’re given. As long as we put a nice spin on it, they won’t even notice what’s happening to them”. What’s happening is, of course, that our freedoms are being stolen from us, and all we’re getting in return is meaningless soundbites. There is an election tomorrow (as I write this). You can see that certain politicians, currently in office, have no respect whatsoever for you, your opinions or your freedoms. You can’t shift them out yet. 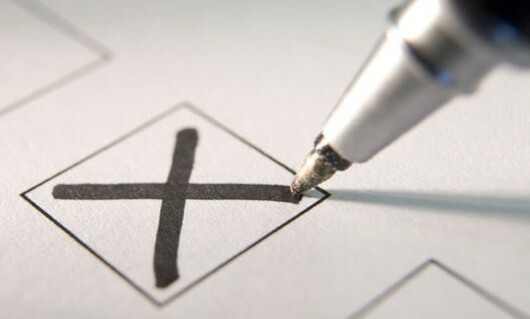 But you can – those of you who are voting tomorrow – send a message to them and, if you have any self-respect, you will. I hope you get the representatives – and the respect – you deserve. I have been saddened to learn of two events that will take place in the near future: The death of The Dandy, and the publication of Britannia Unchained. The first needs little introduction to British readers; it’s the UK’s longest-running children’s humour comic, which will cease publication (in print form) towards the end of this year, on its 75th anniversary. The second appears to be an odious political tract scribbled by a cabal of ambitious right-wing Tory MPs, desperate to make a name for themselves by tarring British workers as “among the worst idlers in the world”. The connection? Even at the end of its life, there is better and more useful information in The Dandy than there will be in Britannia Unchained. The book’s authors, Priti Patel, Elizabeth Truss, Dominic Raab, Chris Skidmore, and Kwasi Kwarteng, all members of the Free Enterprise Group of Tory MPs, argue that British workers are “among the worst idlers in the world”, that the UK “rewards laziness” and “too many people in Britain prefer a lie-in to hard work”. They say the UK needs to reward a culture of “graft, risk and effort” and “stop bailing out the reckless, avoiding all risk and rewarding laziness”. Strong words – undermined completely by the authors’ own record of attendance at their place of work. Chris Skidmore’s Parliamentary attendance record is just 88.1 per cent – and he’s the most diligent of the five. Kwasi Kwarteng weighs in at 87.6 per cent; Elizabeth Truss at 85.3 per cent; and Priti Patel at 81.8 per cent. Dominic Raab is the laziest of the lot, with Parliamentary attendance of just 79.1 per cent. To put that in perspective, if I took more than a week’s sick leave per year from my last workplace, I would have been hauled up before the boss and serious questions asked about my future at the company. That’s a 97.9 per cent minimum requirement. Who are these slackers to tell me, or anyone else who does real work, that we are lazy? Some have already suggested that these evil-minded hypocrites are just taking cheap shots at others, to make themselves look good for promotion in an autumn reshuffle. Maybe this is true, although David Cameron would be very unwise to do anything but distance himself from them and their dangerous ideas. Britain doesn’t reward laziness among its working class. What it rewards is failure by managers, directors of industry, financiers. These people continually increase their salaries and other remuneration while their share prices fall, their dividend payments are lacklustre and shareholder value is destroyed. What have they given shareholders over the past 10 years? How many industrial or commercial leaders have walked off with millions, leaving behind companies that were struggling, if not collapsing? Does the criticism in Britannia Unchained apply to senior executives and bankers? Our MPs are as much to blame as big business. They vote themselves generous pay, pensions and extended vacations (five months per year). They never start work before 11am, never work weekends (or most Fridays, when they are supposed to be in their constituencies, if I recall correctly). They enjoy fringe benefits including subsidised bars, restaurants and gyms. They take part-time directorships in large companies which take up time they should be using to serve the public. Only a few years ago we discovered that large numbers of them were cheating on their expense claims. They take more than £32,000 in “Resettlement Grant” if we kick them out after one term – which, in my opinion, means all five authors of Britannia Unchained should be applying for it in 2015. These are the people who most strongly represent the ‘something-for-nothing’ sense of entitlement the book decries. Have any of them ever worked in a factory or carried out manual labour? I’ll answer that for you: With the exception of Elizabeth Truss, who did a few years as a management accountant at Shell/Cable and Wireless, none of them have ever done anything that could be called real work. In fact, the people they accuse work very long hours – especially the self-employed. When I ran my own news website, I was busy for 12-14 hours a day (much to the distress of my girlfriend). Employees also work long hours, get less annual leave, earn less and pay more – in prices for consumer goods, taxes and hidden taxes – than most of Europe. Average monthly pay rates have now dropped so low that they are failing to cover workers’ costs, leading to borrowing and debt. Are British workers really among the laziest in the world? Accurate information is hard to find but it seems likely we’re around 24th on the world league table. On a planet with more than 200 sovereign nations (204 attended the London Olympics), that’s not too shabby at all. Interestingly, the European workers clocking on for the fewest hours are German. Those lazy Teutons! How dare they work so little and still have the powerhouse economy of the continent? If so many are reluctant to get up in the morning, why are the morning commuter trains standing room only? Or have the Britannia Unchained crowd never used this form of travel? It seems to me that Britannia Unchained is just another attempt by the Tory right to make us work harder for less pay. The Coalition is currently cutting the public sector and benefits to the bone, while failing to introduce policies that create useful employment, and trying to boost private sector jobs. The private sector has cut wages and pensions. The result is higher unemployment and benefits that cannot sustain living costs, creating a working-age population desperate for any kind of employment at all (even at the too-low wages already discussed). And let’s remember that Conservatives want to remove employment laws to make it easier to dismiss employees. In other words, they want a workforce that will toil for a pittance, under threat of swift dismissal and the loss of what little they have. Why do they think this will improve the UK’s performance? We already work longer hours and have less protective legislation than in Europe (such as the European Time Directive). But we are less productive in terms of GDP than their French and German counterparts, who work fewer hours and are protected by the likes of the ETD. France is more unionised than we are, yet its production per employee is higher. The problem is poor management and bad leadership. Poor productivity is almost always due to poor investment and poor training. Workers are abused when they should be treated as an investment. They lose motivation and when managers get their decisions wrong, they blame the workers. Working class people are sick of grafting for low pay and in poor working conditions, to be exploited by the types of people represented by the authors of Britannia Unchained. Is it any wonder we feel de-motivated? I started this article by linking The Dandy to Britannia Unchained, noting that one was coming to the end of its life in print while the other was about to be published for the first time. I’ll end by pointing out a quality they have in common. The Dandy is closing because it represents ideas that are now tired and out-of-date. Britannia Unchained should never see publication – for the same reason.